Israel, which sees an existential threat in a nuclear Iran, has made clear that its patience is limited. The Ross team does not think Israelis are bluffing. They believe Israel views Iran in life-and-death terms. Israeli officials have argued that they don’t believe Iran would ever be crazy enough to nuke them but do believe the change in the balance of power with a nuclear or near-nuclear Iran could be so decisive that Jews would begin to leave Israel. Cohen’s line says a lot. One of my biggest regrets over the course of the last year was not being able to return to Iran. I did try, but the being an American, one is required to have a Ministry approved tour-guide with you at all times. This was not prohibitively expensive when I traveled there in 2006 with my father. It’s less costly to split the price for two than it is one. And so I was unable to return. My friends in Meshed and Tehran are fairly involved in the protests, or so at least they email me on a regular basis. I wish I were there to see it all first hand. I can only relate how serious about reform they were when I met them in 2006. I can only imagine it is more urgent now. Another one of my regrets was missing Israel. I do have a standing invitation from friends in Tel Aviv and I hope to visit in October for my birthday. We shall see. This morning’s surf session was rough. 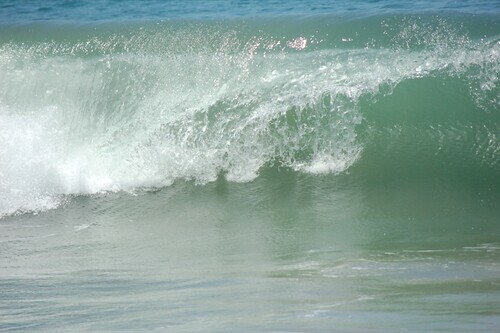 It may sound like fun and games, but as I wrote earlier, I’ve never seen waves like this. 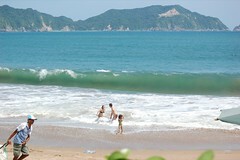 The first time I’d ever surfed was in Mazatlan back in 2007. Positively tame compared to these waters. Managing a six or seven foot swell, paddling a board and trying to get up is a full body work-out. After the morning session–mind you I was just off the bus, and hadn’t slept much in anticipation–I was exhausted. Our room was sweltering, sweat dripping from my temples even after two cold showers. I laid on the bed, soaking wet. Reyes, my buddy from Austin who’s from the area just laughed at me. He tends to do that a lot. He’s short, squat and very much has the indio look going on. “Wimp. You stay here. I’m going for a drink,” he said, “and you’re not invited.” The door slammed and I slept. “Meet Julio and Brandon,” he said. “Doood,” the two teenagers replied in unison. “You speak English?” I asked. We walked the 200 meters to the beach. Off we went. The waves were two-thirds to half the size they were earlier so I felt better about actually getting up on the board this time. After my third attempt I managed a soft glide, tried to turn, twisted and careened right into the break. Ouch. But not so bad. Two more attempts met with failure. Irritating. And panting like a beat dog. And then a nice swell rolled in. I’d been hunting this one all day. I called Reyes off, paddled in and off I went. I was up. Nice. Made for a turn. Misjudged the curl. Thrashed by a three foot wave. Did an epic mid air cartwheel. Head first into the surf. Sand in my nose. Sand in my ears. Salt water in my eyes. The entire beach laughed at my pyrotechnic gymnastics. Had I not been gagged and bleary eyed I would have laughed too. Reyes road in and finally managed to stop laughing. I looked up at him with salty, blood shot eyes. “Can I have that drink now?” I asked. “Si, se puede,” he said, laughing all the way down the beach. 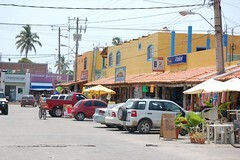 Tomorrow, if the muse permits, I’m off to Mexico. To be specific, a seedy little surfer’s village on the Pacific Coast where the waves are fierce, the locals dissolute and the scenery unforgettable. 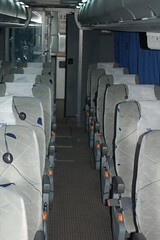 It’s about a 24 hour trip by bus–Monterrey, Guadalajara, up over the mountains and down to coast. The camera and my beat up, trusty old MacBookPro will be in tow. 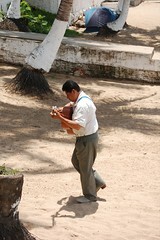 The return journey will take me back to Taxco and then Mexico City to see some art by Diego Rivera. The tall drink o’ water grabbed his hand. “You’ll dance and you’ll like it,” she said. On that note Sean Paul walked off down the road to perdition.